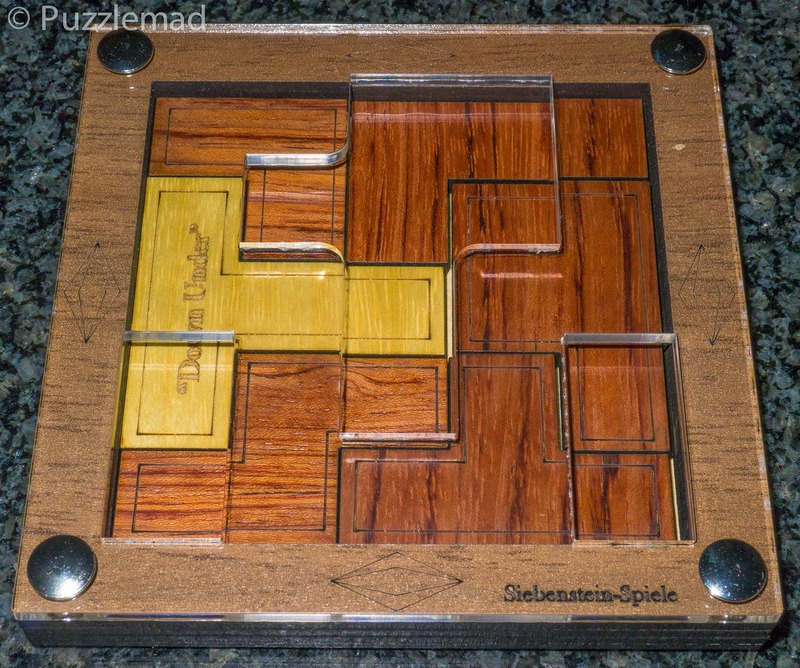 This week I am back to my dwindling supply from Puzzle Master in order to continue showing off some of the more affordable puzzles out there for you. My insomnia has recently got much worse (down from about 4 hours sleep to 3-3½!!) and so I have taken to trying some of the more difficult puzzles in the evenings whilst Mrs S and I watch TV. If I just watch TV or try to work on a simple puzzle (one which doesn't require huge amount of thought) then I quickly find myself annoying Mrs S as I drop off to sleep and snore rather loudly in front of the TV - Yes I know that’s not a good image and I do apologise! However you should at least appreciate the tremendous skill involve with snoring whilst actually sitting upright! 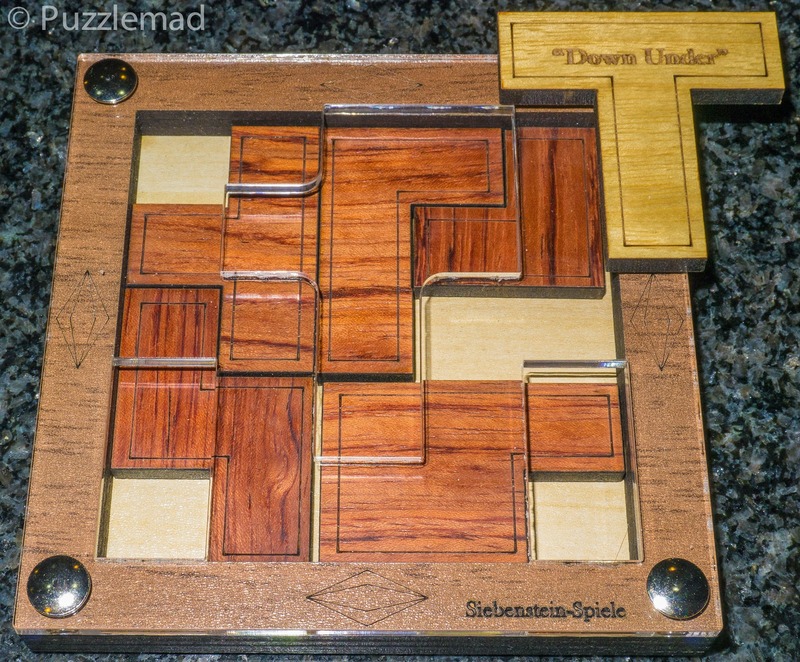 I have been putting off attempting the Down Under puzzle for a while - it is primarily a packing puzzle and I am notoriously awful at these. It has gotten so bad that I have more or less stopped buying them unless they are either beautiful or there is some other interesting puzzling feature to them. 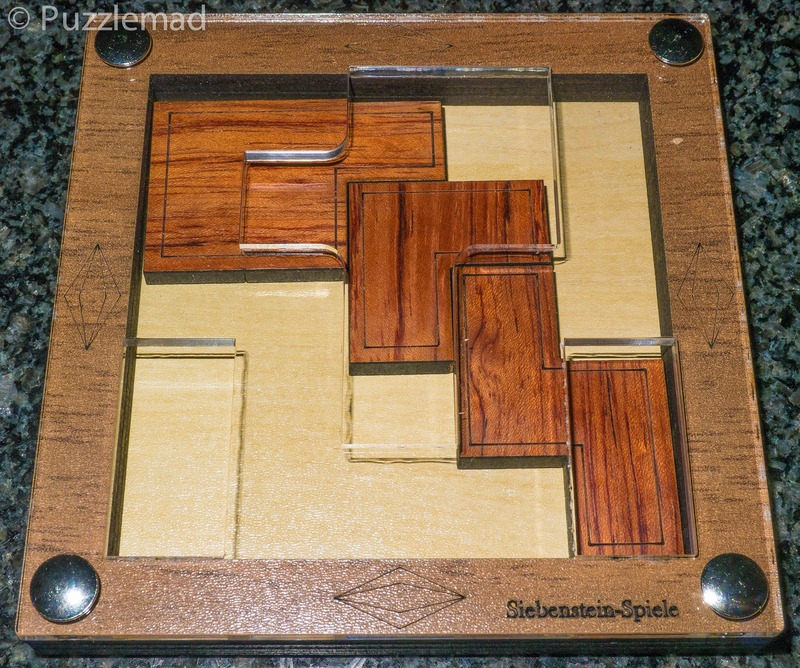 I said that this is primarily a packing puzzle but in this case it does have that other feature in that it is also a sliding piece puzzle (another group which I am not good at and have almost none in my collection). On top of that I suspected from the shape that it required non orthogonal moves to solve it (because it shares some features with the T for two and T for three puzzles I wrote about in July last year. 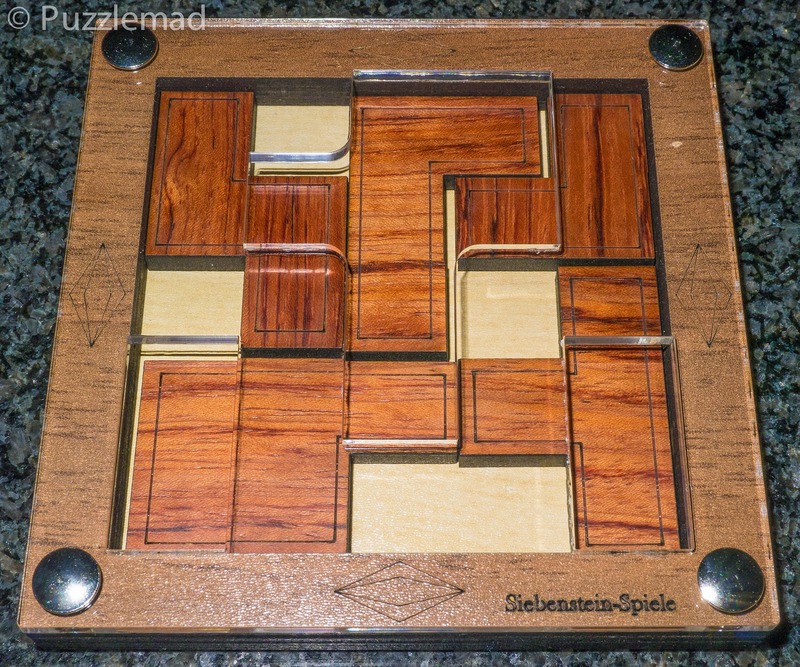 This puzzle is produced by the fantastic German puzzle company, Siebenstein Spiele (oddly they don't appear to have a website of their own) and was designed by Jürgen Reiche. 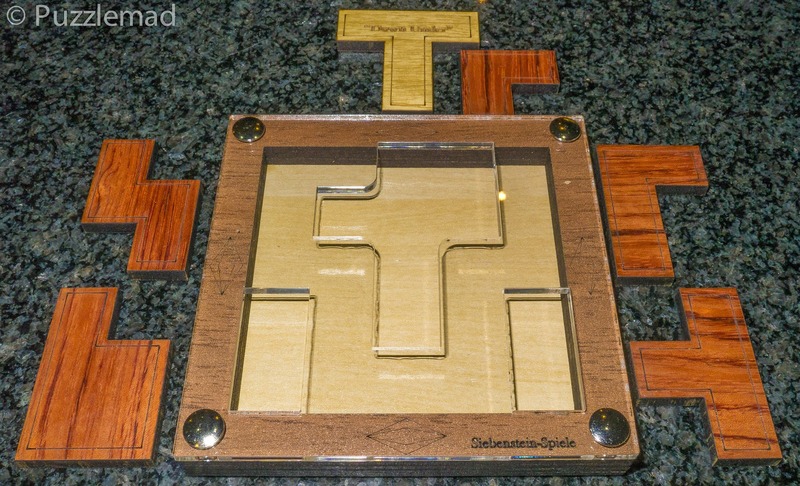 It is made from acrylic and beautifully laser cut and engraved pieces of wood in several colours. In the pack, the leaflet gives the instruction to put all 6 pieces beneath the acrylic lid into the frame. It also says there are more challenges on the reverse of the paper but when I flipped it over it was blank! Luckily the Puzzle Master product page has the other challenges listed on it! Puzzle Master have rated this as level 9 (Gruelling) on their scale of 5 to 10 which is a bit higher than the manufacturer’s own rating of 5 on a scale of 1 to 7. 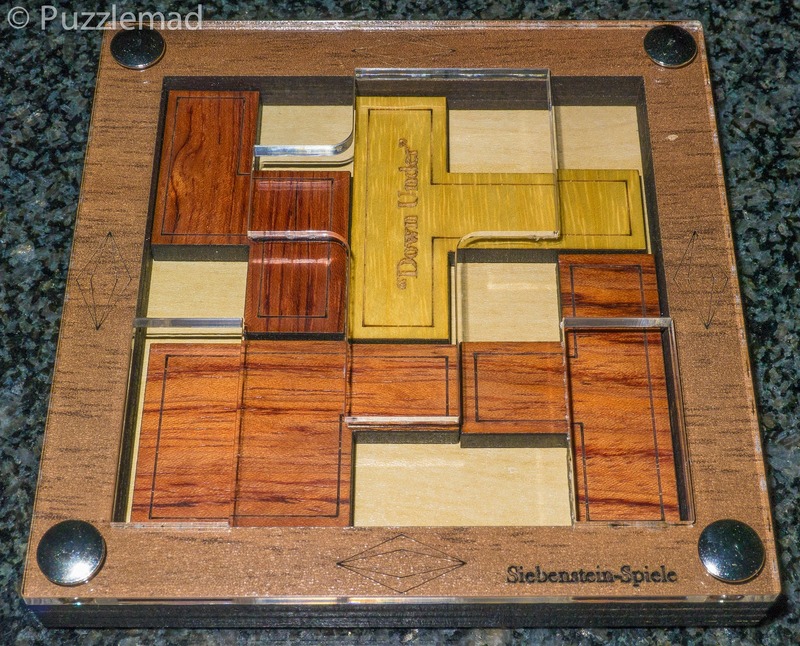 At 11.2 cm square and 1.5cm deep this is a great puzzle to slip into a bag to use on the go and is good value at $27 (especially with the current fall in value of the Canadian dollar). No solution is provided in the package but it can be downloaded from here. So last night, with some trepidation I took the pieces out of the tray to allow me to visualise the shape of the holes in the acrylic through which they must be placed. The darker 5 pieces are easy to place alone but getting that 6th piece in alongside them should be quite a decent challenge (especially for me in my sleep deprived state and being rubbish at packing puzzles). I took a deep breath, balanced the tray upside down on the sleeping cat on my lap and decided to work out how the 6 pieces could fit together in a 5 unit square. There are quite a few possible ways to fit the pieces together outside of the tray and after finding one, I attempted to recreate it in the tray. I hit a wall at this point - I did not know which orientation it should be in. Foolishly I assumed that the T would be upright in the frame and spent a good 45 minutes trying to achieve that by putting the pieces into the tray in different orders and sliding them about inside. Failing many many times and going back to looking for an alternative packing method on the back of the tray (much to my cat's disgust). After that 45 minutes, I finally decided that maybe the orientation of the T does not need to be upright and started to play with alternative arrangements. It was at this point that I had my Aha! moment - I finally noticed that the shape of the hole in the acrylic was the key feature and that maybe orthogonal entry was not essential. Now I was able to experiment in am more directed fashion and quickly finally found a solution. I was not convinced that it was correct because one of the pieces was upside down and the nice engraving not visible. Below is a spoiler photo - click the button ONLY if you want to see my incorrect solution. The correct solution - MUCH more elegant! That was all that I managed to get done last night and went to bed feeling rather pleased with myself. What about the other challenges? They are nowhere near as difficult but still a fun thing to think about and stimulate the old grey matter. I managed to do them over about 10 minutes this morning. The aim in the accessory challenges is to try packing the 5 of the pieces in such a way they cannot slide around inside the frame. Then try to do the same thing with four pieces and finally repeat it with just three pieces. Sounds tough? It's not too hard if you think about the size of the frame and the shapes of the pieces you have here. Clicking on the spoiler button below will show the 3 solutions. 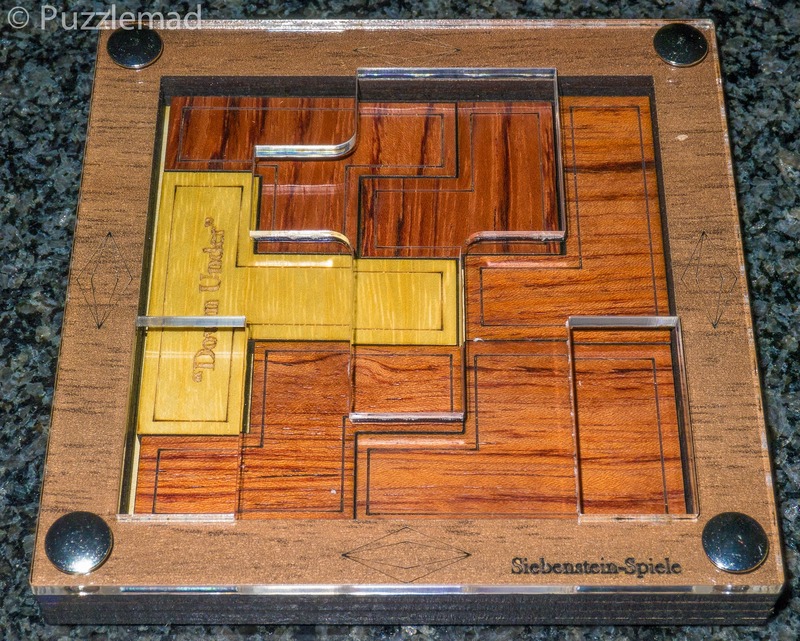 So if you are into packing puzzles or into sliding piece puzzles then you should definitely give this a try! Even if you are rubbish at those types of puzzles then this will not prove impossible for you and is definitely worth a try. The price is good and it is beautifully made - it will look good on display after you are done! I think I will be taking this one to work for the next few weeks to torture my colleagues with. I don't think the patients will be able to solve it as it is not particularly suitable for manipulation whilst you are lying down.